Governor Chet Culver says there’s "no need for alarm" about the condition of the state budget, while Republican legislators accuse the Democratic governor of a "wrongheaded" approach to a pending financial crisis. The state’s fiscal year ends June 30th. State tax collections have fallen below expectations, causing some to question whether the budget may wind up in the red. Culver says he does not share those concerns. "I’ve been in constant communication with my budget director…and we are meeting with department heads this afternoon and that will be one of the topics of discussion," Culver says. "But we are almost through the end of the fiscal year and we believe we will be able to balance and close the books on the fiscal year." The state budget plan for the past 12 months has included an ending balance or "cushion" of nearly$50 million. The governor has the authority to transfer up to $50 million out of the state’s cash reserve to make the books balance, but a Legislative Services Agency analysis released this week suggests the budget hole may be larger than $100 million. Senate Republican Leader Paul McKinley of Chariton says it appears the governor is opting for a "wing and a prayer" approach. "That’s his decision. He’s in a position to do that," McKinley says. "…But I think to imply that the state’s fiscal matters are in good shape is absolutely wrongheaded." Culver bristles at the suggestion the state may be headed toward a deficit. "There’s no need for alarm. You know, unfortunately, sometimes opportunities like this are taken more in more of a political context," Culver says. "…We have $441 million in our cash reserves; we have the eighth-fastest growing economy in the United States of America and Des Moines is the 14th-fastest growing city in America, so we’re doing a lot of things right." McKinley, the Republican leader in the senate, counters that Culver "refuses to accept reality" and start making dramatic cuts in state spending. "You know, I’ve traveled all over the state…and people are really up in arms over the fiscal condition and the lack of attention to the fiscal state of affairs of Iowa," McKinley says. McKinley is considering a run for governor in 2010 and if he were to win the Republican nomination he’d face Culver, who plans to seek a second term. During the Farm Crisis of the 1980s when Republican Terry Branstad was governor the state delaying making school aid payments in order to balance the books and maintain a cash flow. The current governor says that’s not being considered now. During a brief question-and-answer session with reporters today in his formal office, Culver refused to — in his words — "speculate" about what options may be under consideration if the budget picture worsens. 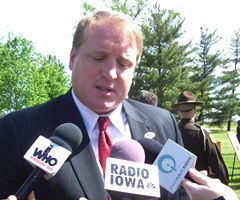 Culver signed a proclamation for Iowa’s "Juneteenth Celebration" before talking with reporters about the budget picture. Click on the audio link below to listen to the question-and-answer session held in his formal office.